Batty for Candy Embroidered Jumbo Treat Bag There's no trick to figuring out who owns these goodies, stashed in their very own Embroidered Trick-or-Treat Bag! Our canvas youth treat bag is skillfully embroidered with a full color black bat featuring any name in vivid orange so their treats won’t be mistaken as anyone else’s! Cute Kitty Embroidered Jumbo Treat Bag There's no trick to figuring out who owns these goodies, stashed in their very own personalized Embroidered Trick-or-Treat Bag! 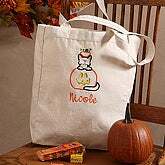 Our canvas youth treat bag is skillfully embroidered with a full multi-color kitty cat and jack-o-lantern design featuring any name in vivid orange so their treats won’t be mistaken as anyone else’s! Witch Trick or Treat Bag Get our Witch 3D Trick or Treat Bag for your child today. This quality constructed halloween trick or treat bag is 100% durable felt fabric with each panel filled with polyester batting. 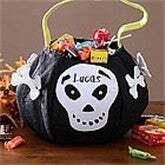 This 8x10 bag with reinforced handles will hold all of your childs treats this year and the next! Surface clean. Frankenstein Trick or Treat Bag Get our 3D Frankenstien Trick or Treat Bag for your child today. This quality constructed halloween trick or treat bag is 100% durable felt fabric with each panel filled with polyester batting. This 8x10 bag with reinforced handles will hold all of your childs treats this year and the next! Surface clean. Pun'kin Girl Trick or Treat Bag Get our Pun'kin Girl 3D Trick or Treat Bag for your child today. This quality constructed halloween trick or treat bag is 100% durable felt fabric with each panel filled with polyester batting. 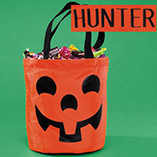 This 8x8 bag with reinforced handles will hold all of your childs treats this year and the next! Surface clean. Personalized Boo-tiful Girl Trick or Treat Bag Every boo-tiful girl should have a personalized treat bag! This bag has plenty of room for candy and can be reused for book and shopping long after Halloween is over. This white Tote Bag measures 16 1/2" x 16 1/2" has black nylon straps. The bag is made of 100% Polyester Duck (a tightly woven, heavy, plain weave fabric with a hard, durable finish). Perfect for books, groceries or everyday use. Daddy's Little Ghoul Trick or Treat Bag Every little ghoul needs this bag to show the worls how much she loves her daddy! This bag has plenty of room for candy and can be reused for book and shopping long after Halloween is over. This white Tote Bag measures 16 1/2" x 16 1/2" has black nylon straps. The bag is made of 100% Polyester Duck (a tightly woven, heavy, plain weave fabric with a hard, durable finish). Perfect for books, groceries or everyday use. Dancing Skeleton Trick or Treat Bag This dancing skeleton is ready for trick or treating fun. This bag has plenty of room for candy and can be reused for book and shopping long after Halloween is over. This white Tote Bag measures 16 1/2" x 16 1/2" has black nylon straps. The bag is made of 100% Polyester Duck (a tightly woven, heavy, plain weave fabric with a hard, durable finish). Perfect for books, groceries or everyday use. Ghostly Fun Personalized Trick or Treat Bag This cute ghost makes the perfect trick-or-treat partner. This bag has plenty of room for candy and can be reused for book and shopping long after Halloween is over.This white Tote Bag measures 16 1/2" x 16 1/2" has black nylon straps. The bag is made of 100% Polyester Duck (a tightly woven, heavy, plain weave fabric with a hard, durable finish). Perfect for books, groceries or everyday use. Little Witch Trick or Treat Bag A cute little witch decorates this fun halloween candy treat bag. This bag has plenty of room for candy and can be reused for book and shopping long after Halloween is over. This white Tote Bag measures 16 1/2" x 16 1/2" has black nylon straps. The bag is made of 100% Polyester Duck (a tightly woven, heavy, plain weave fabric with a hard, durable finish). Perfect for books, groceries or everyday use. Mommy's Little Monster Trick or Treat Bag This cute little blue monster makes the perfect trick-or-treat companion.This bag has plenty of room for candy and can be reused for book and shopping long after Halloween is over. This white Tote Bag measures 16 1/2" x 16 1/2" has black nylon straps. The bag is made of 100% Polyester Duck (a tightly woven, heavy, plain weave fabric with a hard, durable finish). Perfect for books, groceries or everyday use. Monster Trick or Treat bag These cute monsters make the perfect trick or treat companions. This bag has plenty of room for candy and can be reused for book and shopping long after Halloween is over.This white Tote Bag measures 16 1/2" x 16 1/2" has black nylon straps. The bag is made of 100% Polyester Duck (a tightly woven, heavy, plain weave fabric with a hard, durable finish). Perfect for books, groceries or everyday use. Skull and Crossbones Personalized Name Treat Bag The perfect treat bag for that special piratein your life.This bag has plenty of room for candy and can be reused for book and shopping long after Halloween is over.This bag has plenty of room for candy and can be reused for book and shopping long after Halloween is over. This white Tote Bag measures 16 1/2" x 16 1/2" has black nylon straps. The bag is made of 100% Polyester Duck (a tightly woven, heavy, plain weave fabric with a hard, durable finish). Perfect for books, groceries or everyday use. Witchy Name Trick or Treat Bag This tote bag makes a great gift for that bewitching person in your life. This bag has plenty of room for candy and can be reused for book and shopping long after Halloween is over.This white Tote Bag measures 16 1/2" x 16 1/2" has black nylon straps. The bag is made of 100% Polyester Duck (a tightly woven, heavy, plain weave fabric with a hard, durable finish). Perfect for books, groceries or everyday use. • 9 x 9 x 8 "
Halloween Treat Bags Special treat baskets make trick-or-treating even more fun! Felt baskets feature appliqued details and bright colors. Choose Monster, Witch, Ghost, Pumpkin or Skeleton. Polyester. Spot clean. Imported. Exclusively ours. Halloween Treat Bags Made to last for many trick-or-treat nights to come. Choose from Spider, Witch, Bat or Pumpkin. Mister Bones Trick-or-Treat Basket Soft and plump with lots of room for goodies! 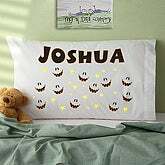 Durable poly-cotton with embroidered and appliqud felt faces, 3-D details and easy-carry handles. 6x10 1/2" to 12 1/2x14". Name to 12 letters. Spider Trick-or-Treat Basket Soft and plump with lots of room for goodies! Durable poly-cotton with embroidered and appliqud felt faces, 3-D details and easy-carry handles. 6x10 1/2" to 12 1/2x14". Name to 12 letters. Accessory pirate treat basket That "twinkle" in his eye is actually an LED light-up eye! Soft, plump, fearsome, and funny, this pirate bag is packed with personality---and ready to be packed with lots of goodies! Poly-cotton with embroidered and appliqud felt features, 3D details and handles. 6 1/2 x 10 1/2" to 8 x 9". Name to 12 letters. Accessory bat treat basket Fill em up! They're soft and plump, funny or fearsome. Poly-cotton with embroidered and appliqud felt features, 3-D details and handles. 6 1/2 x 10 1/2" to 8x9". Name to 12 letters. Access ghoul treatbasket w.light eye Fill em up! Our exclusive baskets hold gobs of goodies, tons of treats. Theyre soft and plump, funny or fearsome. Poly-cotton with embroidered and appliqud felt features, 3D details and handles. 6 1/2 x 10 1/2" to 8 x 9". Name to 12 letters. Black Cat Trick-or-Treat Basket A soft and plump trick-or-treat basket with lots of room for goodies! Durable poly-cotton basket has embroidered and appliqud felt faces, 3-D details and easy-carry handles. 6x10 1/2" to 12 1/2x14". Name to 12 letters. Jack-o'-lantern Trick-or-Treat Basket A soft and plump trick-or-treat basket with lots of room for goodies! Durable poly-cotton basket has embroidered and appliqud felt faces, 3-D details and easy-carry handles. 6x10 1/2" to 12 1/2x14". Name to 12 letters. Personalized Spooky Shapes 3-D Trick-or-Treat Bags There's no trick to figuring out who owns these goodies, stashed in their very own Spooky Shapes 3-D Trick-or-Treat Bags! Whimsical, fun designs feature your choice of a colorful boy or girl pumpkin, cute kitty cat or skeleton, each ready to stash their treats from house to house. We custom embroider the name of your boy or ghoul in your choice of 3 font styles in the thread color shown for each design, claiming complete ownership of the bounty of treats inside! Each design features intricate applique and embroidered detail, making the bag stand out from all the rest! Treat Bag -Witch A Personal Creations Exclusive! Our soft 100% polyester plush baskets are perfect for trick or treating. We embroider each with any name, up to 8 characters. Baskets measure 7"Hx7"Dia. Spot clean. Treat Bag -Frankenstein A Personal Creations Exclusive! Our soft 100% polyester plush baskets are perfect for trick or treating. We embroider each with any name, up to 8 characters. Baskets measure 7"Hx7"Dia. Spot clean. Personalized Halloween Character Tote Bag Exclusive! 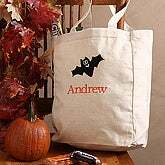 Our fun "Trick or Treat" tote bag leaves no doubt who owns all the goodies within! 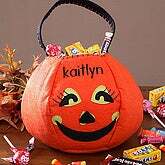 We personalize the bag with our Boy or Girl Halloween Characters and any name, up to 9 characters. Cotton/poly blend fabric. Measures 10"Lx10-1/2"W. Machine washable. Exclusive! Our soft 100% polyester plush baskets are perfect for trick or treating. We embroider each with any name, up to 8 characters. Baskets measure 7"Hx7"Dia. Spot clean. Personalized Trick or Treat Bag - Ghost Exclusive! Our soft 100% polyester plush baskets are perfect for trick or treating. We embroider each with any name, up to 8 characters. Baskets measure 7"Hx7"Dia. Spot clean. Personalized Trick or Treat Bag - Spider Exclusive! Our soft 100% polyester plush baskets are perfect for trick or treating. We embroider each with any name, up to 8 characters. Baskets measure 7"Hx7"Dia. Spot clean. 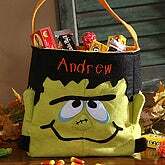 Frankenstein Treat Sack For the serious Halloween snackers ... our new treat sack carries a full load of candy loot! 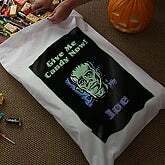 We transformed a standard pillowcase into a clever carrying sack, and added a frightfully fun "Frankenstein" design across the front, complete with your trick-or-treater's name or nickname. Perfect for older kids who need larger bags for more treats! Candy Monster Treat Sack For the serious Halloween snackers ... our new treat sack carries a full load of candy loot! 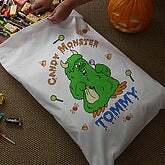 We transformed our standard pillowcase into a clever carrying sack, and added a frightfully fun "Candy Monster" design across the front, complete with your trick-or-treater's name, as shown. Perfect for older kids who need larger bags for more treats! Standard-size pillowcase is made of a 50/50 cotton/poly blend; measures 42" x 34". The Count Treat Sack For the serious Halloween snackers ... our new treat sack carries a full load of candy loot! 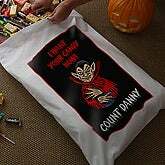 We transformed a standard pillowcase into a clever carrying sack, and added a frightfully fun "Count" design across the front, complete with your trick-or-treater's name, nickname, etc. Perfect for older kids who need larger bags for more treats! Personalized Frankenstein Trick or Treat Bag There's no trick to figuring out who owns these goodies, stashed in their very own Embroidered 3-D Trick-or-Treat Bags! There's no trick to figuring out who owns these goodies, stashed in their very own Embroidered 3-D Trick-or-Treat Bags! Personalized Skeleton Bones Trick or Treat Bag There's no trick to figuring out who owns these goodies, stashed in their very own Embroidered 3-D Trick-or-Treat Bags! Corny Halloween Pillowcase Tuck in your favorite boy or "ghoul" with our not-so-spooky pillowcases! 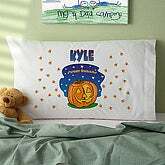 Each adorable design features a festive Halloween graphic, along with your child's name to let them confortably "rest in peace"! Standard-size pillowcase is made of a comfy 50/50 cotton/poly blend; measures 42" x 34". Machine wash/dry. Sweet dreams guaranteed! Also makes a great, "oversized" treat bag! Spooky Faces Halloween Pillowcase Tuck in your favorite boy or "ghoul" with our not-so-spooky pillowcases! Each adorable design features a festive Halloween graphic, along with your child's name to let them confortably "rest in peace"! Standard-size pillowcase is made of a comfy 50/50 cotton/poly blend; measures 42" x 34". Machine wash/dry. Sweet dreams guaranteed! Fiber Optic Handbags Celebrate Halloween in spook-tacular fashion! Eerie, glowing fiber optics highlight spider, pumpkin, and ghost designs on these lined gray felt handbags. Use in place of your old purse during the Autumn season, or let your favorite trick-or-treater use for sweet loot! Spider handbag is 8"H and ghost handbag is 12"H, not including sturdy handles. Requires 3 AA batteries, not included. Battery pack is hidden in the lining. These collectible paper mache containers are great for decorating the house, making Halloween gift baskets or for putting candy in at your party. Makes for a very special trick or treat container too. 6" by 6" excluding the handle. Sold individually. cat finger puppet felt bag This felt bag is screechingly cute. Featuring a black cat finger puppet peeking out from behind a pumpkin applique, it makes a spooktacular alternative to a standard Halloween candy bowl. 8" long by 10" wide. 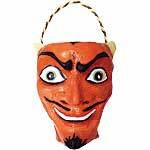 devil paper mache candy container These collectible paper mache containers are great for decorating the house, making Halloween gift baskets or for putting candy in at your party. Makes for a very special trick or treat container too. 6" by 6" excluding the handle. Sold individually. Totebag Halloween Girl by Pen at Hand This fun tote bag made of natural white canvas features a girl dressed as a witch trick-or-treating on Halloween. Your text is printed in scary orange letters at the top of the bag. The bag measures 10.5" wide by 14" tall by 5" deep. The different girl head and hair choices are shown below the main image. Totebag Halloween Boy by Pen at Hand This fun tote bag made of natural white canvas features a boy dressed as a superhero trick-or-treating on Halloween. Your text is printed in scary orange letters at the top of the bag. The bag measures 10.5" wide by 14" tall by 5" deep. The different boy head and hair choices are shown below the main image. 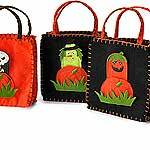 'halloween' small felt bags - set of 4 These felt bags are frightfully cute. 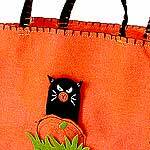 Each features a Halloween character finger puppet peeking out from behind a pumpkin applique. Fill them with candy corn for spooktacular favors. 6" square. 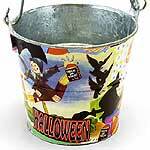 Set of 4.
halloween bucket - bitsy Fill this nifty handmade decoupage bucket with candy to give out at the door. Halloween icons dance across its surface making it the perfect snack server for an October bash. 6" tall by 6" diameter. Light-Up Jack-O-Lantern Treat Bag Add a special sparkle to treat collecting! 11 1/2 x 10 1/4" with 3" gusset, 16" webbed handles. Nylon-lined, battery pack inside controls random-flashing lights with on/off switch. Light-Up Ghost Treat Bag Add a special sparkle to treat collecting! 11 1/2 x 10 1/4" with 3" gusset, 16" webbed handles. Nylon-lined, battery pack inside controls random-flashing lights with on/off switch. Light-Up Witch Treat Bag Add a special sparkle to treat collecting! 11 1/2 x 10 1/4" with 3" gusset, 16" webbed handles. Nylon-lined, battery pack inside controls random-flashing lights with on/off switch. Personalized Treat Bags Exclusive! With ample room for stashing candy and goodies, our bewitching tote bags are a Halloween must-have! The bags are made of 100% polyester felt and feature cute 3-dimensional designs and contrasting stitching. We embroider any name, up to 10 chars. Select from Pumpkin, Black Cat, or Ghost design. Spot clean. Measures 12 1/2”L x 8 1/2”W x 3 1/2”D. GIANT Halloween Treat Sack - Frankenstein A Personal Creations Exclusive! Our Frankenstein Halloween Sack will let them go trick or treating for hours! Add any name up to 9 characters. 42x36 sack is made in USA of cotton/poly. Machine Wash. GIANT Halloween Treat Sack - Witch A Personal Creations Exclusive! 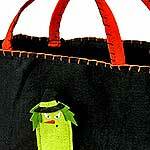 Our Cute Witch Halloween Sack will let them go trick or treating for hours! Add any name up to 9 characters. 42x36 sack is made in USA of cotton/poly. Machine Wash.
Sur La Table Halloween Felt Candy Bags Adorable bags help little ones manage their Halloween haul. Spot clean. Spider-Man Candy Bucket How else do you carry your super-Spidey treats? Our sturdy plastic treat bucket has a handle and measures 8¼" diameter x 8"H. Coordinates perfectly with our Baby Spider-Man costume (#10710) and children?s Spider-Man costume (#08564). Elmo Folding Candy Pail A treat for little Elmo fans! Complete Elmo's costume with this matching Halloween treat bag. Sturdy, wipe-clean plastic, measures 6½"L x 8"W, and folds for easy storage. For ages 3 and up. 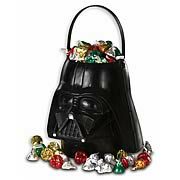 Darth Vader Trick or Treat Pail Have a treat with the Dark Side! No Darth Vader costume can be complete without a full bucket of candy to show for your work! The 6-inch tall black bucket features Darth Vader's likeness on the pail and a 2 piece, snap-together design for easy storage. witch finger puppet felt bag This felt bag is wickedly cute. It features a witch finger puppet peeking out from behind a pumpkin applique. Fill it with candy corn to make a spooktacular centerpiece. 8" long by 10" wide. PUMPKIN CANDY HOLDERS Just right for the small trick or treater. 2 1/2" Tall. (without handle). 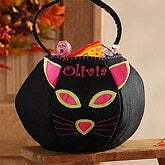 Pumpkin Trick or Treat Bags Personalized Bright, neon-orange pumpkin carries sweet loot, bearing the name of someone who's cute! 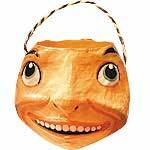 Generous nylon trick-or-treat bag features a jack-o-lantern face on one side; we'll embroider your trick-or-treater's name on the other. Specify name; limit 1 line, 12 letters/spaces. Durable nylon with two sturdy handles.13" wide x 9 3/4" high. • Overall Dimensions: 9"x4"x12 "